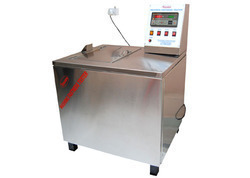 We are a leading Manufacturer of wash fastness tester from New Delhi, India. We are the manufacture of Wash Fastness Tester. These Lab Dyeing Equipment are manufactured as per International Standards & cater the needs of Industry and Institutions. Warmth controlled by Digital warmth sign and manager. The inward sleeping room made of Stainless iron alloy and outside body is made of mild iron alloy dust coated.